name of Bokhara Trumpeter shortly after World War Two when relations between the United States and Stalinist Russia became stressed to the breaking point. The name "Russian" was changed back to "Bokhara" so as not to tag the breed as "Russian" when it was being promoted. underwent restorative name changes to take away the nationality. One example are the Borzoi, which prior to these stressed relations was well known simply as the Russian Wolfhound. That name was changed back to its native "Borzoi" to remove the word "russian" from the dog. the Russki Barabanshik & the Bokharski Barabanshik. upon assorted extravagant Boinije. We assume that this refers to a crossing of the Ankhut Trumpeter and the forerunners of the modern day Bokhara Tumblers. 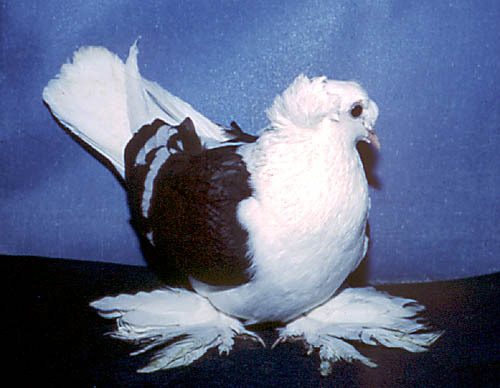 where as the Bokharski Barabanshik has evolved dramatically as an ornamental breed.